Super Hero Boy: I finally understand what the fuss is all about! I finally understand what the fuss is all about! All my younger cousins ever talk about it seems is High School Musical. Then over the weekend again all I heard about is High School Musical from my two grown girlfriends. I figured it was about time I broke out High School Musical 2 to find out just exactly what all the fuss is about. One of the high schools i went to actually had a "Wildcats" team but I can't for the life of me remember which one it was (I went to several... we moved a lot.. heh) but regardless none and I do mean NONE of the schools I went to were even close to as cool as the kids at East High. There is something kind of addicting about them as the Wildcats, though all incredibly gorgeous, are a fairly diverse set of friends. Though I'm not sure the average teen has half the fashion sense or the looks of most of the Wildcats, I certainly didn't, it is nice to see a group of kids hanging out that may not otherwise. With that said High School Musical 2 Deluxe Dance Edition was really actually quite entertaining. The Wildcats have taken up summer jobs at Sharpay's parent's country club. Sharpay has her own ideas though as she tries everything she can to attempt to get him to sing with her in the summer talent show, not to mention win his heart. Too bad she is obnoxious and incredibly self centered, not the most attractive traits. Needless to say Troy has a big decision to make, the easy life, or doing the right thing by his friends and himself. The biggest feature about High School Musical 2 Deluxe Dance Edition is the massive amount of extras. There is so much in fact that there is actually almost twice as much extra features as there is film! Including a special sneak peak at High School Musical 3! Speaking of High School Musical 3 there is a free ticket to see it included with the DVD! You can get your own copy of High School Musical 2 Deluxe Dance Edition at Amazon! 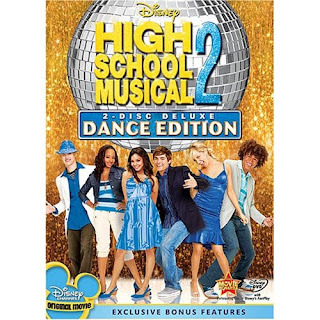 I have two copies of High School Musical 2 Deluxe Dance Edition to give away to my readers! Leave a comment on this post. Check out High School Musical 2 Deluxe Dance Edition and tell me who is your favorite High School Musical character . My sister told me High School Musical was awesome. I figured it was her high school student brain imagining things. Then my husband rented HSM 2 (we are both in our late 20s and the only kiddo doesn't even talk yet). Shocker: we both enjoyed it. My fave character was Sharpay cause I wanted to call her Sharpee like the marker. And I wished Lucas Gabreel got more face time. I just liked his character alot. Thanks! I like Zeke. He's the one always baking. That is too funny. With 2 girls, I have watched the movies too many times to count. they would enjoy this. Ryan is my favorite from HSM. Gabrielle is my family's favorite. My favorite is Taylor McKessie. I don't have a favorite really, but my girls love it! My daughter's favorite is Gabrielle. Thanks for the contest. There is just something about Charpe (sp?). You gotta love her! We like the whole crew, but our favorite is Troy. We love Gabrielle! My daughter especially loves her. My daughter loves Sharpei, I quote "She is evil, but totally fun!" Taylor is my favorite, thanks! Troy is my (granddaughters) favorite. Gabrielle. Thanks for the contest. Gabrielle is my niece and nephews favorite character. They would think I'm the best auntie in the whole world if I won this for them!!! I gotta' admit, I like Sharpay. Kelsey (the piano player) is a close second. my 12yo sister would LOVE LOVE LOVE this! She's so into them! I like gabrielle! We adore HSM in my home! We don't have the 2nd DVD though! I must admit, I'm a Troy fan! What a cutie! This would make a perfect gift for my girls for Christmas! Thanks! I love Ryan. He cracks me up. Thanks! Sharpei...There is always one in the bunch. We love Vanessa Anne Hudgens she is very talented. I have a very illegal crush on Troy, shhh! My kids never really got into the HSM thing, they think it is too babish. They are 13 and 15, I guess HSM is just not cool enough for them. Anyways, I do have a niece that is 9 and she really loves it. I think Gabrielle is her favorite. Thanks for the contest and congrats to the winner!! My favorite High School Musical character is Troy. Thanks!! My girls love Gabrielle...fun giveaway! Troy is my niece's favorite. It's a great show. Gabrielle is my granddaughters favorite. Thank you! My boys love Gabrielle. They would be so excited to win this. THanks. Gabriella (Vanessa Hudgens) is my sweetie. Please accept my entry. Thank you. Troy is so pretty, I can't help it! My favorite character is Sharpay. The blonde. Blondes have more fun. Sharpay althought they're making her too nice, i live a good villain. Gabriella is my favorite! However, the complete cast is enjoyable! My girls all have a crush on Troy. I like Sharpay. Gabrielle is my daughter's favorite! The kids love that movie! they Sharpay because she is so fun! The one that irritates me least (hee hee) is Troy. Sorry. This is allllll about the kinder. Gotta say my favorite character is Sharpay - she's pure camp and a riot in all of her musical numbers. My daughters love HSM, their favorite character is Gabrielle. My daughters love HSM. They think that Sharpei is "Fabulous"
I still haven't seen HSM although my friend's daughter keeps telling me how great it is. Her favorite is Gabrielle. Sharpei is my daughter's favorite. Thanks for the opportunity to win.